This article clearly shows how the psychological use of “We, Our and Us” forms the psyche of Muslim minds to believe they are commanded by Allah. It creates a feeling of unity with the Creator and the compulsion to impose this unity on all people with the altruistic belief that they are promoting the integration of mankind with the Creator. This article opens up a forum for all people interested in resolving the looming threat of Islam by identifying the problem and presenting solutions to avert WWIII. A silent response signifies fear, or one is not aware of, the killing of millions of people in the name of a rogue religion – Islam. It is time to ‘Wake Up’ or lose the ability to voice your opinion. The alternative is to become a Muslim and find out the hard way that you have been made a fool to believe in a God Allah that is willing to murder His creations. Do not be fooled by the liberal and Muslim media by easily accepting their Islamic propaganda. All people need to educate themselves about Islam and the Qur’an. A good start begins by reading this article and to investigate ways to eliminate a religion that teaches its followers to deny the religious beliefs of others. A question raised about Islam is, “Why do Muslim extremists force their Islamic religion on people with different religious beliefs?” An answer will help to understand why this prevalent problem exists so that efforts can be made to solve the problem. A problem so encompassing that Muslims will even commit suicide to kill nonbelievers of Islam. The scripture used to indoctrinate people to become Muslims, whereby they commit total surrender to Allah, is The Qur’an. Imams, caliphs, and mullahs teach that Islam is the true religion, the religion of truth, and that Islam will prevail over every other religion. It is this indoctrination that forms the psyche of the Muslim mind. It creates a feeling of unity with the Creator and the compulsion to impose this unity on all people with the altruistic belief that they are promoting the integration of mankind with the Creator. But how is The Qur’an implemented to become the instrument for effective indoctrination? There are three efforts that insure success of the indoctrination process. First, imams, caliphs and mullahs use The Qur’an to teach that Islam is the religion of truth, the true religion, and will prevail over all others. Secondly, The Qur’an prescribes warnings, punishments, and admonishments that will result in death of nonbelievers and apostates for not following Islam. The third is to subjugate the thinking mind of Muslims to prayer at least five times a day in a submissive position of surrender to Allah. The combination of constant brain-washing of possessing a superior religion, intimidation caused by fear of loss of their lives, and submissiveness to Allah, forms the mental psyche of the initiate to be easily led by Islamic religious leaders. Prayer is for many people a way of appealing to their God and with such reflection may be able to alter their behavior and find strength to endure difficult times. But when prayer is used to subject the mind only on the One God Allah, whereby one’s whole being is totally dedicated to following His commands, then one can easily be manipulated. Excessive praying at least times a day, head bowed to the ground, instills in the believer a subservient mindset, which enables a religious leader to command the follower to perform abominable acts against innocent people. 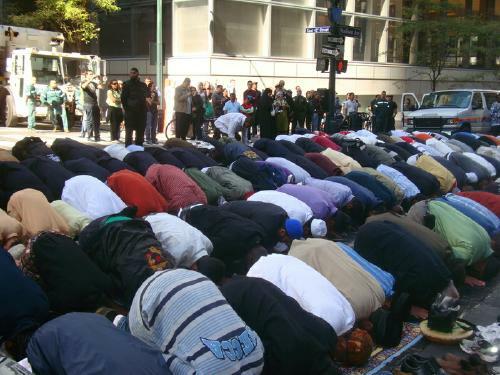 The following Figure illustrates that the duty to pray is so ingrained in the believer that they will even pray on the city streets of New York. 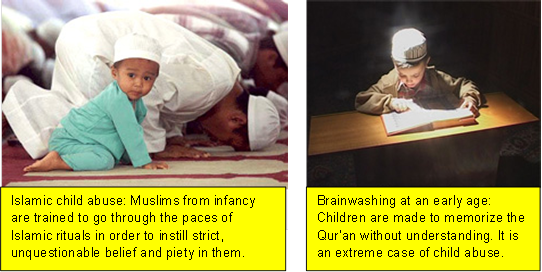 Indoctrination of the Muslim mind begins soon after birth and into the early years of mental growth. This is why even the most intelligent of Muslim men and women find it hard to renounce the Islamic faith. The featured photo of this post combines two photos taken from a well written article titled, Islamization of the Muslim Mind by Mumin Salih, which appeared July 13, 2009 on the Internet. Still, how it is that intelligent people are successfully indoctrinated into the beliefs of Islamic dogma when the past history of Islam reveals it has gained its large numbers of followers not by love and compassion but by brutal force with only two alternatives: pay a tax (extortion) or follow the teachings of Islam. A negative response results in death and confiscation of one’s property and wealth. In light of Islam’s growth by conquest of countries and subjugating people, denying their religion and traditional culture, it is surprising that Islam continues to spread like a cancer. The reality is that good, hard-working people who are only interested in meeting the necessities of life are no match for armies of indoctrinated men that find it easier to live off the wealth and property of others. But we again question how is it intelligent educated men follow the dogma of Islam? Many have become professors, scientists, and writers whereby they continue to praise and support their Islamic religion. The answer is a simple one – constant indoctrination conditions the mind to accept a particular world view; one of superiority that is instilled with the precepts that Islam is the true religion, the religion of truth, and shall prevail over all other religions (Qur’an 9:29 and 9:33). There is a fourth component that accomplishes successful indoctrination; it is an insidious inherent undertone of The Qur’an that projects into the Muslim mind an affinity with the Creator. This undertone is accomplished with the use of pronouns, “We, Our and Us.” They are used to identify the Islamic god Allah. The use of We throughout the Qur’an has caused much controversy because Muslim religious leaders have obfuscated and interpreted it as meaning it is a singular entity, the one God Allah. They insist this is simply use of the “Royal We” by Allah, which is similar to royal kings in addressing and commanding their followers. They insist that although “We” refers to Allah He is “one God” and should not be associated with any of His followers or angels. But in The Qur’an we find that this insistence is not valid. Many suras (verses) appear in The Qur’an that reveal We associates Allah with a group of men that enforce the commands, punishments, and warnings of Allah. To unravel this conundrum of whether We is Allah or a party of men, it is best to use the suras themselves to provide an answer. The following suras were taken from the earliest English translation by Muhammad Zafrulla Khan. Readers of The Qur’an should avoid translations of the past 20 to 30 years because they have been altered to be ‘Politically Correct’ and actually change the original intent. The Qur’an sanctions a Party of Men to implement its dogma. These men enforce the punishments and atrocities cited in The Qur’an and kill people believing that they are commanded by Allah. This is made possible by use of ‘We, Our and Us;’ a technique in The Qur’an that allows the Muslim mind to associate their actions with Allah. The authorization of such a party occurs in the following sura. The suras are provided to allow the reader to ponder, think, and evaluate for themselves the veracity of the conclusions that follow. Sura 3:105. Let there be from among you a party whose business it should be to invite goodness, to enjoin equity and to forbid evil. It is they who shall prosper. We find in the following sura that this “party” are men arrogant enough to believe that they can change, abrogate and forget the commands of God with even better commands. Sura 2:106-108. Whatever previous commandment We abrogate or cause to be forgotten, We reveal in this Qur’an one better or the like thereof: Knowest thou not that Allah has full power to do all that He wills? This sura does not identity the one god Allah as abrogating, cause to be forgotten, or replace a command with one better – but reveals a Party of Men. Why would Allah associate Himself with followers to revise or rescind any of His God-given commands? Below, we find that indeed there is a Party of Men, which will henceforth be referred to as the We Party. In the following sura, Islamic religious leaders claim that “We” is Allah. But this is a false claim as the following sura clearly identifies a Party of Men that kills people while asleep at night or in the afternoon. Sura 7:5-7. Little is it that you heed. How many a town have We destroyed! Our punishment came upon their dwellers by night or while they slept at noon. When Our punishment came upon them all they could utter was: We are indeed wrongdoers. Any intelligent person can discern that it could not be Allah, the All Forgiving and Ever Merciful God, that destroys towns and inflict punishment while dwellers are asleep at night or at noon. It is clear that only a Party of Men, identified as “We and Our” would cause such punishment. To resolve any question that a Party of Men and NOT Allah inflicts punishments and death, the following sura in The Qur’an unquestionably provides the answer. It clearly reveals that a religious leader or military commander, not Allah, motivates an army to kill disbelievers. Sura 8:16-19. O ye who believe, when you encounter an hostile force of the disbelievers, turn not your backs on them. Whoso turns his back on them on such an occasion, unless maneuvering for battle or turning to join another company, shall draw upon himself the wrath of Allah and hell shall be his abode. An evil resort it is. Thus on the day of Badr it was not you who slew them, but it was Allah who killed them; and it was not thou who didst throw gravel at their faces, but it was Allah Who threw it, that He might confer a great favour upon the believers. Surely, Allah is All-Hearing, All-Knowing. That is so; and Allah will surely undermine the design of the disbelievers. Clearly, the above sura was written by a commander as one reads of the strategy not to turn and run when encountering a hostile force unless it is necessary to maneuver for battle by turning and joining another company. But notice in the second paragraph that the commander uses his leadership to strengthen the resolve of his troops by stating, “it was not you who slew them, but it was Allah who killed them.” Clearly, these are not the words of Allah but a commander or a powerful religious leader. The commander insights his men with the belief, “it was not thou who didst throw gravel at their faces, but it was Allah Who threw it. The above suras demonstrate that the use of “We, Our and Us” associates Allah with a Party of Men. It is a psychological technique used to motivate Muslims to perform the abominations described in The Qur’an. The We, Our and Us psychological technique is a key method to the successful indoctrination of Muslims to believe it is Allah that directs their actions. This technique, together with the incessant indoctrination of praying five times a day to Allah fortifies submissive behavior of Muslims to follow their religious leaders. Beginning at an early age, indoctrination is highly effective and affects even the most intelligent of men and women whereby they find it difficult to refute the dogma instilled in them. Indoctrination is used to instill sound moral behavior for citizens of a civilization to live together in harmony. But it can be used to develop robotic minds that are transformed to inflict terror and violence. Ones’ mental blackboard is programmed to deny any view that is contrary to inculcated dogma, which instills a sense of superiority over others. The teaching that Islam is the true religion and will prevail over all other religions creates a mindset that people who are not Muslims are inferior for they are not following the all forgiving and ever merciful God. The following Figure illustrates the indoctrination of a young boy to kill others, and even themselves, in promoting the cause to follow Allah and His messenger Muhammad. 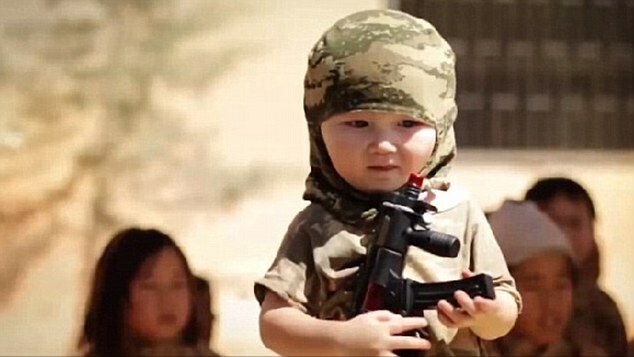 The photo was obtained from an article by Jenny Stanton and Jay Akbar published March 11, 2015 titled, “How ISIS is creating a ‘generation of monsters: The sickening tactics terror horde uses to groom vulnerable children into killers and suicide bombers.” This Figure reveals there is no age limit for religious extremists to indoctrinate a child to become a killer. The Adhan (Azan) is the call to prayer. Below is the Arabic and English translation. 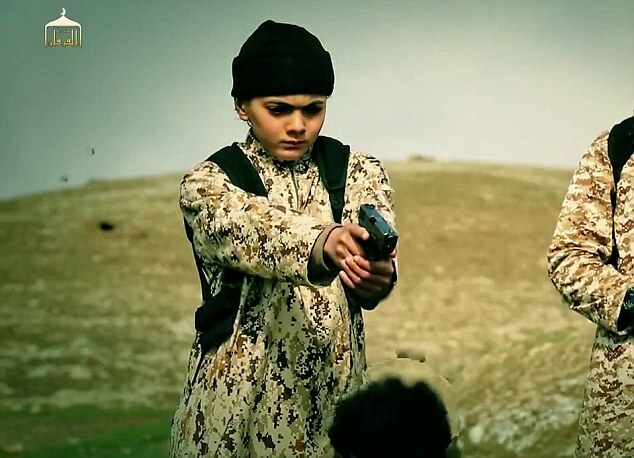 The Figure below is photo of a boy about to shoot an ISIS hostage in the forehead. After the deadly shot, the boy shoots him three more times, points his gun to the sky in celebration, and with one final shot shouts ‘Allahu Akbar!’ This footage of a child carrying out such a brutal execution has sent shock waves around the world. People should not be surprised that brainwashing of youngsters by ISIS and other Islamic organizations is key to their ongoing objective to dominate the world. The Qur’an is used as a manual by a Party of Men to indoctrinate young minds to establish an Islamic Caliphate and dominate the world. Indoctrination of young minds begins shortly after birth and forms a mindset that makes the initiate a follower and slave to the commands of its leaders. Due to the indoctrinated mind of Muslims they will not assimilate the values of any country that does not follow the teachings of Islam. Muslims are indoctrinated to impose their religion on nonbelievers by force and are willing kill them, and themselves in suicide attacks, in their cause to follow Allah and His messenger Muhammad. People in all free-democratic countries who enjoy the freedoms of speech and individual liberty to follow their aspirations and make their own choices in life must reject Islam; a religion that breeds bigotry, hate, violence and killing of nonbelievers of Islam. Islamic leaders must revise or rewrite The Qur’an to incorporate God’s greatest command. It was announced by a Man of God three times – love one another. Failure to revise The Qur’an with God’s greatest command will result in continued bigotry, hatred, violence, and the killing of innocent people around the world. Revise The Qur’an to advocate love one another. If Islamic religious leaders fail to incorporate God’s greatest command to love one another then they and their followers are to be deported to a Muslim country of their choice. Another alternative is to institute strict rules, as done in Xinjiang, China to halt the spread of Islam. On December 16 of 2008, Xinjiang China began enforcing the following laws and regulations restricting the practice of Islam. Prayers are banned in public areas, private hajj trips not allowed, teaching of the Qur’an not allowed in private, students and government officials forced to eat during Ramadan. In Khotan, signs posted in front of the grand mosque say the weekly Friday prayer sermon must not extend beyond a half-hour. Prayers in public areas outside the mosque are forbidden and residents are banned from worshipping at mosques outside their town. Under the rules, imams are banned from teaching the Qur’an in private and only official versions of the Qur’an are allowed. Studying Arabic is only allowed at special government schools. Government workers are banned from showing the slightest sign of religious devotion. For example, a Muslim civil servant could be sacked for donning hijab. If Islamic religious leaders, and leaders of other faiths, fail to follow God’s command to teach their followers to love one another then it becomes highly probable that a Third World War becomes inevitable. All freedom-loving countries will do well to limit the expansion and incursion of Islam, a rogue religion that indoctrinates its followers to eliminate the religious beliefs of other people. No scripture of God should be used as a manual to forcefully subjugate people to follow a religion through intimation and fear. Islamic religious leaders can correct Muslim abominable behavior by acknowledging and teaching God’s last and greatest command – love one another. The following link presents who announced God’s greatest command. The above link also provides written testaments by former Muslims as to why they left Islam – even at the threat of apostasy that is cause for death. In addition to readers of this article, imams, caliphs, and mullahs are invited to offer any comments or rebuttals. Discussions of this article may be continued with the author by going to the following website. A “Contact the Author” page is provided for each book presented. Thank you for your feedback. I am not a computer expert and can only rely on WordPress software.